SPRINGFIELD, MO. 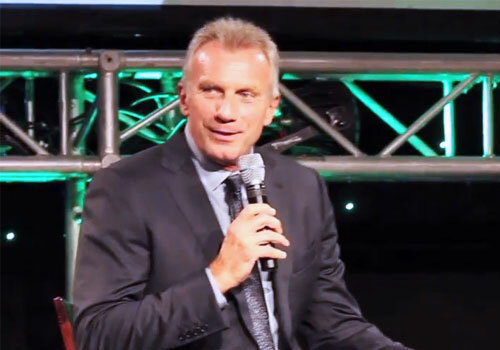 — San Francisco 49ers legendary quarterback, Joe Montana, was the guest speaker on Thursday, June 4, 2015 at the 2015 Best of SW Missouri Preps held at the University Plaza Hotel and Convention Center. The event was presented by the News-Leader. The three-time MVP Super Bowl Champ talked before the program about the best lessons he could give the youngsters in attendance — who amounted to about the top 2 percent of the high school student-athletes in southwest Missouri … and that lesson had little to do with sports. Source: USA Today. 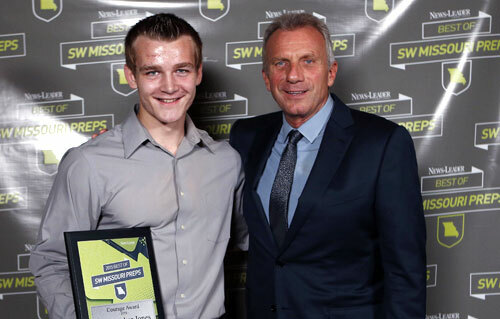 Photo shows Joe Montana, with Christopher Jones from Lighthouse Christian who was awarded the Courage Award during the News-Leader’s 2015 Best of SW Missouri Preps. PHOTO: News-Leader. Lighthouse Christian Chargers, Christopher Jones, received the Courage Award and had arguably the most inspirational story among all the honorees which brought nearly 1,000 people to the event. Jones, who was diagnosed with and defeated testicular cancer, missed only three games before returning to help the Chargers to a repeat championship. And he has the all-clear from his doctors to continue his career at the college level. Joe Montana, believed by many to be the greatest QB in NFL history, played for the San Francisco 49ers and Kansas City Chiefs. During his 14 years with the 49ers, Montana started and won four Super Bowls and was the first player ever to have been named Super Bowl MVP three times. He also holds Super Bowl career records for most passes without an interception (122 in 4 games) and the all-time highest quarterback rating of 127.8. He was elected to the Pro Football Hall of Fame in 2000, his first year of eligibility. In 1999, ESPN named Montana the 25th greatest athlete of the 20th century. In 2006, Sports Illustrated rated him the number one clutch quarterback of all-time. Sports Speakers 360 is a booking agent for motivational sports speakers. If you would like to book pro athletes or NFL stars like Joe Montana for a speaking engagement or appearance, please contact Joe Montana’s booking agent for speaker fee information. For details on how to hire San Francisco players for appearances, call 1.855.303.5450.